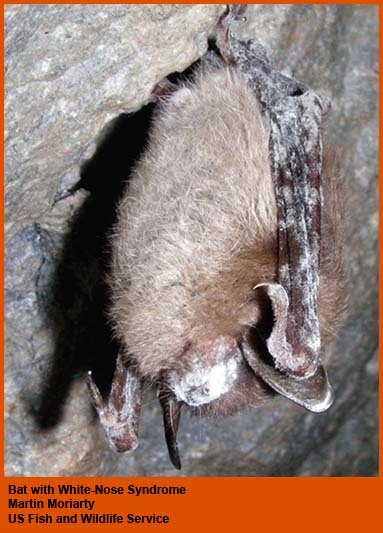 White-nose syndrome has been confirmed in bat hibernation sites in 26 states and 5 Canadian provinces: Alabama, Arkansas, Connecticut, Delaware, Georgia, Illinois, Indiana, Iowa, Kentucky, Maine, Maryland, Massachusetts, Michigan, Missouri, New Hampshire, New Jersey, New York, North Carolina, Ohio, Pennsylvania, South Carolina, Tennessee, Vermont, Virginia, West Virginia, Wisconsin, New Brunswick, Nova Scotia, Ontario, Prince Edward Island and Quebec. found in four additional states: Minnesota, Mississippi, Nebraska and Oklahoma. What is the effect of WNS on bats? We have seen 90 to 100 percent mortality of bats (mostly little brown bats) at hibernacula in the northeastern United States. However, mortality may differ by site and by species within sites. The endangered Indiana bat hibernates in many affected sites. We are closely monitoring Indiana bat populations in many hibernacula and, to the extent possible, in their summer maternity colonies. During the winter of 2008-2009, biologists conducted the biennial rangewide winter counts of Indiana bats. Population estimates based on this count show the overall Indiana bat population declined by approximately 17 percent. This is the first observed decline since 2001. In addition to the Indiana bat, white-nose syndrome has reached the ranges of three more endangered bats: gray bats, Virginia big-eared bats and Ozark big-eared bats. The Northern long-eared bay was listed as threatened in 2015, the first bat species to be listed due to the effects of white-nose syndrome. We are closely monitoring these species as WNS continues to spread.